Size: 18 Months To 2T, Color: Multi is currently out of stock! Size: 2-4, Color: Multi is currently out of stock! Size: 5-6, Color: Multi is currently out of stock! Size: 7-8, Color: Multi is currently out of stock! Jumpsuit with spiky spine and matching hood. Scaly detailed jumpsuit gives a realistic look. Fits toddlers 12-18 months.Jumpsuit with spiky spine and matching hood. Scaly detailed jumpsuit gives a realistic look. 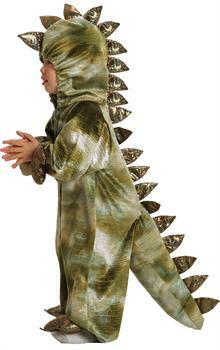 Fits toddler sizes 18 months - 2T.Jumpsuit with spiky spine and matching hood. Scaly detailed jumpsuit gives a realistic look. Fits child xsmall sizes 2-4.Jumpsuit with spiky spine and matching hood. Scaly detailed jumpsuit gives a realistic look. Fits child small sizes 5-6.Jumpsuit with spiky spine and matching hood. Scaly detailed jumpsuit gives a realistic look. Fits child nedium sizes 7-8.